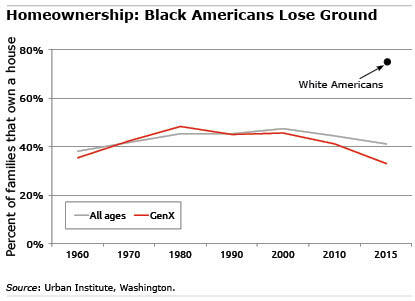 The problem for black Americans is that homeownership is going in the wrong direction. After three decades of rising homeownership in the wake of the Fair Housing Act in 1968, the trend has completely reversed itself, according to a February study by the Urban Institute. Homeownership rates declined for all Americans after the 2006-2008 housing boom and bust. But research shows that, during the boom, more black than white homebuyers who could’ve qualified for regular mortgages took out risky subprime mortgages. Not surprisingly, black homeowners were hardest hit by foreclosures in the bust. Between 2000 and 2015, the share who own homes dropped from 47.3 percent to 41.2 percent – a low not seen since 1970, the Urban Institute found. Black Generation Xers are the biggest concern. Now in their 30s and 40s, they are at the prime age for marrying and having children. Yet this age group’s homeownership rate sank more than 12 percentage points, to just 33 percent in 2015, compared with an 8 percentage-point decline for black baby boomers.